Acetal Sheet Cut To Size Melbourne is an Engineering plastic that has so many unique advantages to offer customers. Offering a huge range of uses it is commonly used in many factories around the world. 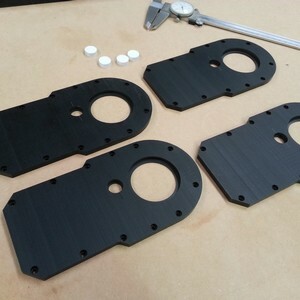 It is probably one of the best Engineering plastics around for machining, as it is very easy to machine. It leaves a smooth and high quality surface & suits modern high speed efficient CNC machines. Acetal is an exceptional engineering plastic for dimensional stability which means that high precision and close tolerance components can be produced. Acetal sheet absorbs almost no moisture and offers good creep resistance allowing it to continue to remain accurate over a long period of time, and over a vast range of environments. Acetal Sheet has high mechanical strength, hardness and stiffness which help Acetal Sheet become an engineering plastic that is often replaced & substituted for steel or other metallic materials. Acetal Sheet is one of the best engineering plastics for is sliding abilities and has a lower coefficient of friction than Nylon Sheet. Acetal Sheet has numerous applications and is particularly valued in the food preparation industry. Acetal Sheet is also one of the engineering plastics chosen within the automotive industry, because of its long term dimensional stability and toughness it provides solutions for designers to help them produce long lasting and very durable components. Another area that has proved popular for acetal is marine applications. This environment suits Acetal/Delrin because the low moisture absorption results in components that will not expand or change dimension due to any contact with water. There are two distinct grade options available of which most common and popular is the co-polymer grade. Co-polymer grade Acetal has slightly better chemical resistance and can help in any food production applications. Homopolymer grade has lower thermal expansion along with slightly improved mechanical strength, stiffness and hardness that may help in specific environments, although this grade is approximately 10% more expensive and size availability range is more limited. It has an optimum long term service temperature range of approximately plus 100°C and a maximum short term temperature range of approximately plus 130°C. Acetal Sheet can melt at a temperature of plus 165°C and Acetal Sheet also has a minimum operating temperature of between -30°C and -50°C.